Hear Ye! Hear Ye! 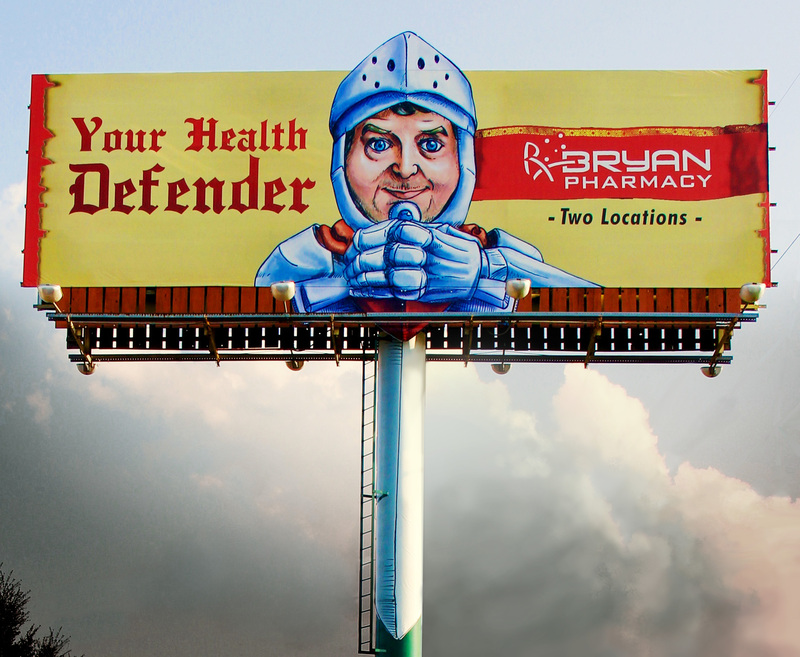 Sir Bryan’s Pharmacy Is Your Health Defender In Enterprise! Sometimes to find a something new and fresh you have to look to the past. 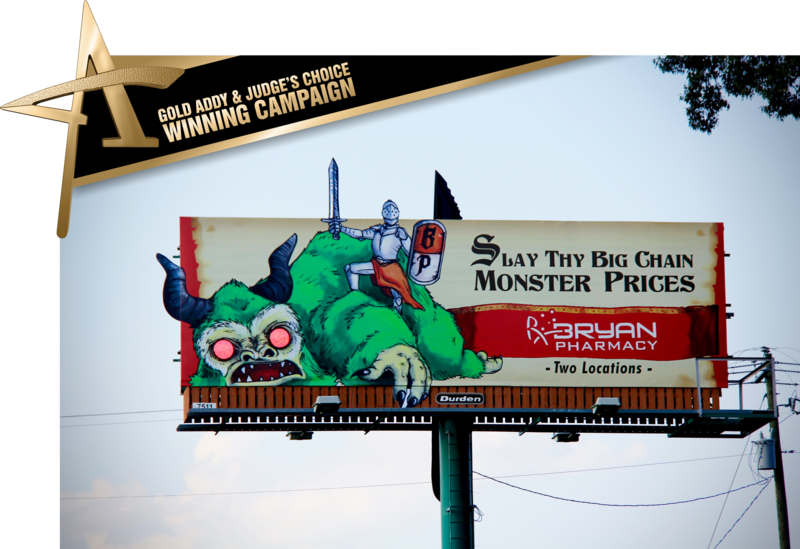 Bryan Pharmacy was ready for a campaign overhaul after their Award-Winning Ninja Campaign. We knew they wanted something epic, and nothing quite compares to the legendary tales of knights fighting monsters and saving the everyday folk. From this spark of idea came, Sir Bryan the Defender of your Health. 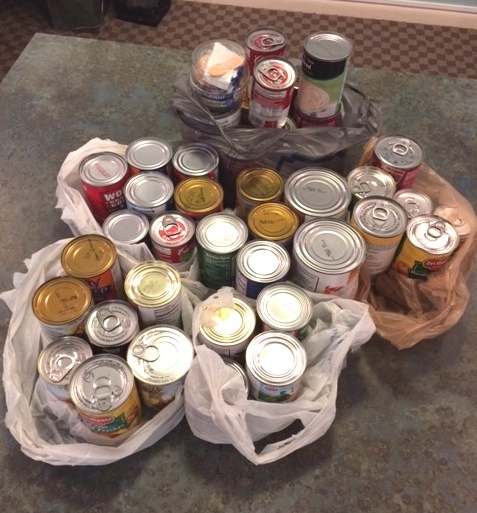 After the initial concept came together and our client gave their support, we were able to expand upon the idea. The knights of old defended the greatest treasures as well, none greater than the legendary Holy Grail, a symbol of purity and an icon of greatness. Bryan Pharmacy is not only a defender but a pinnacle of health care. Also, the imagery of a grail as a mortar and pestle goes hand-in-hand. 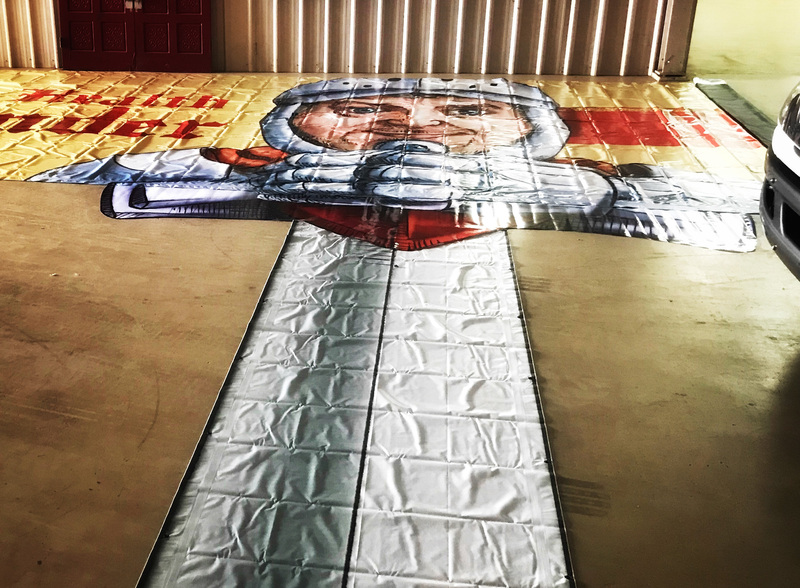 After we established the Holy Grail as a major symbol in the campaign we also circled back to the image of knight, valiantly fighting against disease, discomfort, and the high prices and wait times of big chains. We wanted the owner, Brett Bryan, to be introduced as Sir Bryan, with an illustrated portrait of him as the Health Defender. 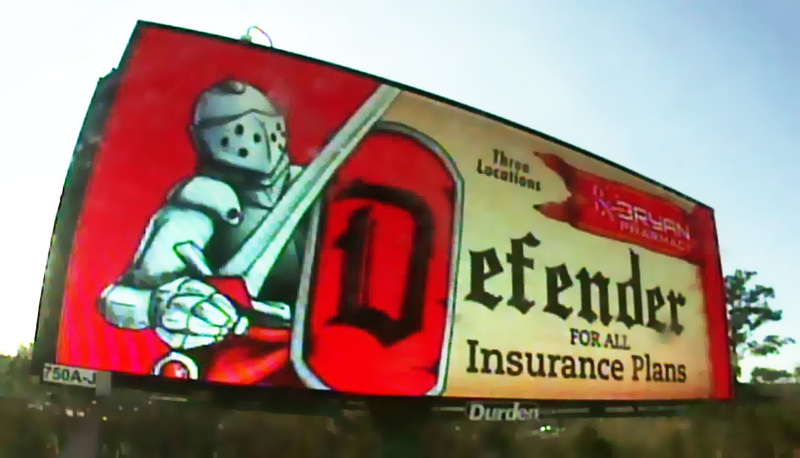 We also found we could include a sword that would stand below the billboard on the billboard’s pole. Another message that Bryan Pharmacy prides themselves in, is their competitive prices against the big chains. To fit the medieval fantasy theme, we placed the big chains as a monster to be slain by your local pharmacy defenders. Altogether, this project was a great exploration of how local businesses can become larger than life and stand strong against the onslaught of big chains and outside influence. Bryan Pharmacy has been in business since 2003, but they continue a tradition of fighting against sickness that has only grown over the centuries. Find out more about Bryan Pharmacy at their website https://www.bryanpharmacy.com/ Not only has this campaign been a great success for Bryan Pharmacy, but it has continued the legacy of ADDY wins for Durden Outdoor. This campaign was a GOLD ADDY winner as well as the 2018 JUDGE’S CHOICE winner. http://www.durdenoutdoor.com/wp-content/uploads/2016/06/DUR-Footer-Logo.png 0 0 dur_admin http://www.durdenoutdoor.com/wp-content/uploads/2016/06/DUR-Footer-Logo.png dur_admin2019-03-04 18:30:152019-03-04 18:30:15Hear Ye! Hear Ye! Sir Bryan’s Pharmacy Is Your Health Defender In Enterprise! 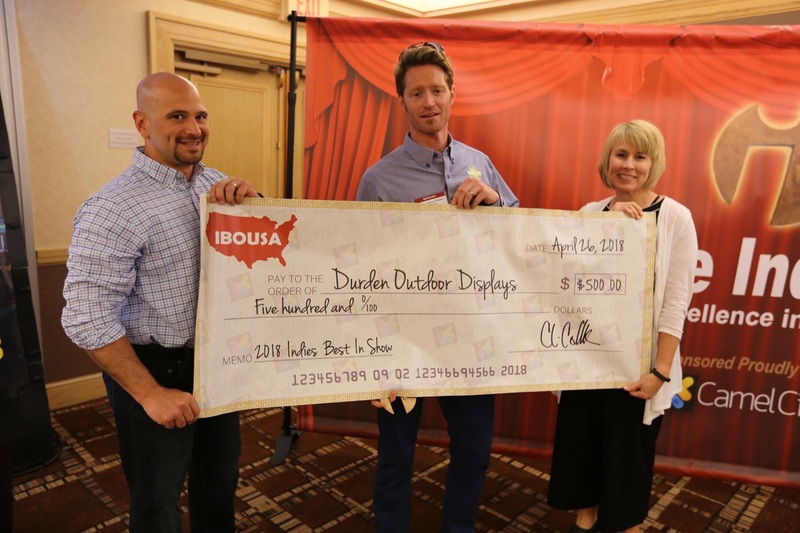 The FAMOUS MAKERS are excited to have won BIG at AAF Dothan’s American Advertising Awards. 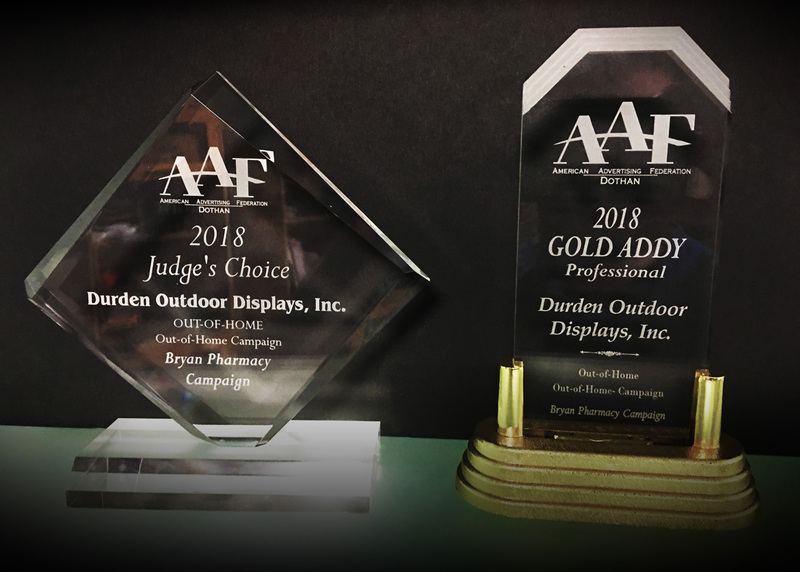 We were honored to have received a GOLD ADDY and JUDGE’S CHOICE for The Cochran Firm License Place Billboard and a SILVER ADDY for Bryan Pharmacy’s “Pharmacy Ninja” Campaign. We pride ourselves on our award-winning Creative Department and would like to extend a thank you to all of our customers who have allowed us to think outside of the box with implementing unique ideas. The American Advertising Awards, formerly known as the ADDY’s, is the advertising industry’s largest and most represented competition, attracting over 40,000 entries every year in local AAF Club competitions. The mission of the American Advertising Awards competition is to recognize and reward the creative spirit of excellence in the art of advertising. By winning locally, the FAMOUS Makers will advance to the District level to compete with entrants from Alabama, Georgia, Mississippi, Tennessee and Louisiana. 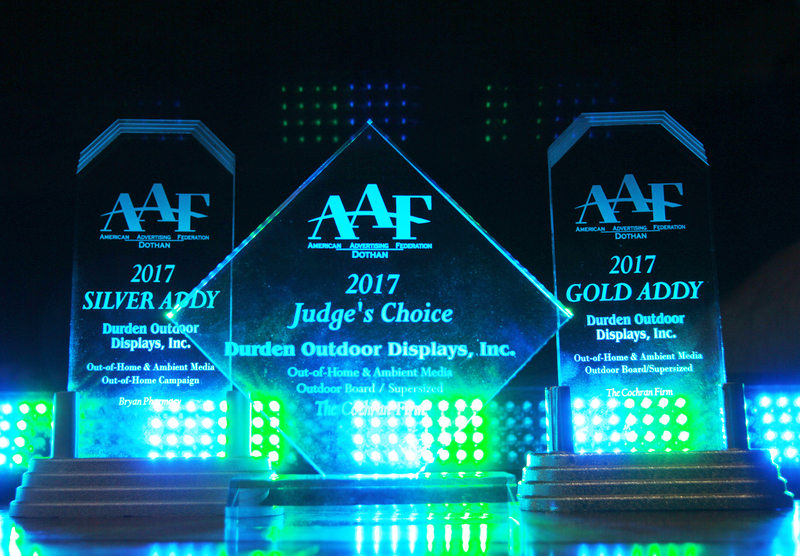 If you would like to be FAMOUS and work with our award-winning creative team, contact us today at 334-792-5056 or sales@durdenoutdoor.com. The FAMOUS MAKERS are excited to announce the addition of Jackson County, Florida into our coverage area. In November, Durden Outdoor Displays, Inc. acquired a billboard company in this market. Since this acquisition, we have built more inventory into this growing market which includes Jackson County and Marianna, Florida’s first Digital Billboard. All of our inventory stretches along Hwy 90 and Hwy 71, targeting local traffic. Highway 90 has a 60% higher traffic count than I-10 or Hwy 231 in Jackson County. “We are excited about the growth of our static billboard inventory & Durden Digital Network into the great state of Florida” says Vice President, Bill Durden. “Jackson County has a population of almost 50,000 and is a large economic draw to the Wiregrass.” The NEW Digital Billboard towers over the highest traveled intersection in Jackson County (Hwy 90 at Hwy 71) and boasts a weekly traffic count of over 234,500+ cars. 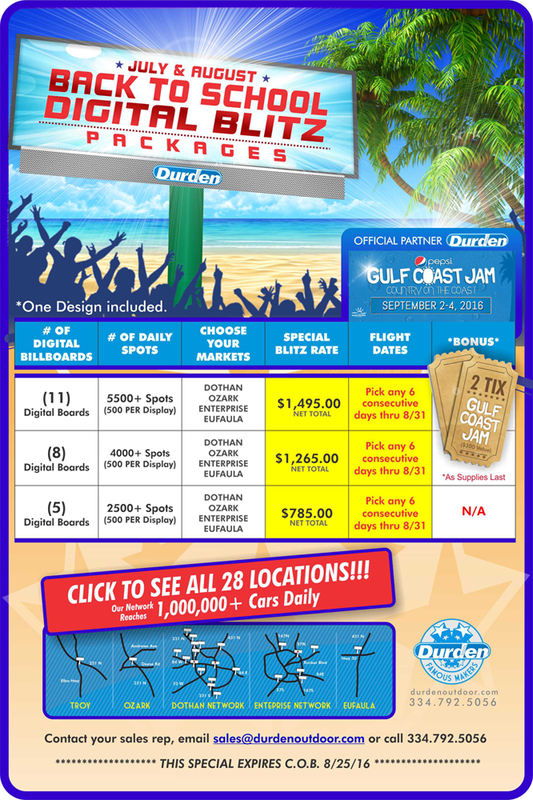 This Digital Billboard marks #30 for the Durden Digital Billboard Network, which reaches over 1.2 million cars per day and spans across 6 Wiregrass cities including Dothan, AL; Enterprise, AL; Ozark, AL; Troy, AL; Eufaula, AL and now Marianna, FL. Our newest inventory can be found near several popular businesses in Jackson County, Florida to include Wal-Mart, Lowes, Tyndall Federal Credit Union, Verizon, Chipola Urgent Care, Aaron’s Rentals, Beef O’ Brady’s, Sonny’s BBQ and many other Marianna restaurants. Durden Outdoor Displays, Inc. was founded by W. Earl Durden in 1968 in Dothan, AL. 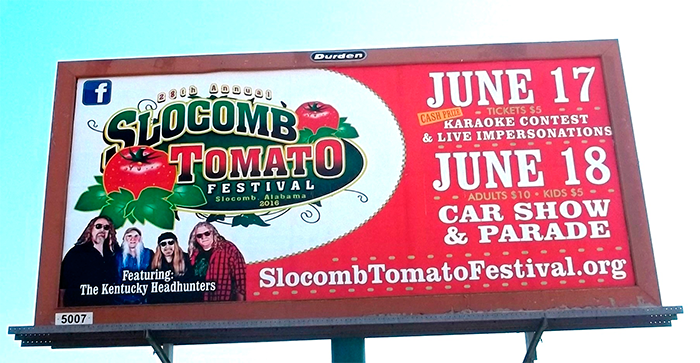 It remains one of the largest privately owned billboard companies in the country which now spans 10 counties in Southeast Alabama, Georgia and Florida. If you would like to be made FAMOUS in Jackson County, Florida call one of our FAMOUS MAKERS today at 334-792-5056 or email us at sales@durdenoutdoor.com. Rhonda Harrison, executive director of the Headland Chamber of Commerce, knows that there is more to the City of Headland than what meets the eye. Mrs. Harrison reached out to Durden Outdoor as Headland was in need of a way to promote community events and new businesses that was affordable and consistent. Although initially hesitant, the board of directors approved to give billboards a try and advertise with Durden Outdoor. After a few strategic conversations, it was determined that our Rotary Poster program was exactly what the Headland Chamber of Commerce needed. Every four weeks, they rotate to a new billboard among a group of approved locations. This allows them to change their message and promotion monthly while keeping a strong presence on Hwy 431 North. 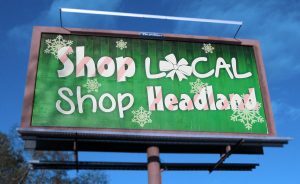 Mrs. Harrison credits their billboards with keeping Headland top of mind in a large audience outside of the city limits and by linking Headland into the community of Dothan. She commended the Durden Creative Department stating “they keep our ads simple yet attractive. Durden’s tactics are strategic and beneficial. The relationship that the Headland Chamber of Commerce and Durden Outdoor have built is strong and one that will last.” If you would like to become FAMOUS, please give us a call today at 334-678-2215 or you may email us at sales@durdenoutdoor.com. WE’RE LOOKING FOR A FEW GOOD FOLKS! http://www.durdenoutdoor.com/wp-content/uploads/2016/06/DUR-Footer-Logo.png 0 0 Amy Riddle http://www.durdenoutdoor.com/wp-content/uploads/2016/06/DUR-Footer-Logo.png Amy Riddle2016-07-19 16:27:462016-11-10 20:46:26WE’RE LOOKING FOR A FEW GOOD FOLKS! With the increasing retail growth to the Troy, AL market, Durden Outdoor expanded its inventory in the Spring of 2016 by acquiring the inventory of Insight Media. First, Durden Outdoor upgraded and better positioned 5 of the 6 locations acquired. Durden also built two new prime time 10’ x 40’ bulletins and also added a new 10’ x 40’ Digital at the highest traffic intersection in the city. To help support the demand of circulation for business who like to saturate the market by using our Rotary Poster Program, we expanded our rotary inventory by adding six new Rotary Poster Boards. Troy is looking forward to the retail growth coming in first Quarter of 2017. Phase One of the new Publix Shopping Center will open which will have eleven store fronts attached and several outer parcels. There are already three new restaurants committed along with a new bank to be built on one of the outer parcels. There will be two new Credit Unions coming to Troy later in 2016. There are also plans for a new retail strip to be added across from Santa Fe Cattle Company. So far in the past year, Troy has seen a new tire store open (Jim Whaley Tires) along with a new Owner of the Ford Dealership and name change to Pike County Ford, the opening of Chicken Salad Chick and several other new retail establishments. After seeing all the new growth in the City of Troy over the past couple of years, Durden Outdoor saw the need to go in and create more inventory and upgrade some existing inventory to be able to support the demand and have the best billboard positions for our Clients. We are excited about the growth of Troy and look forward to helping make many businesses FAMOUS in the Troy, Alabama market. Contact us at sales@durdenoutdoor.com with questions about rates for below.